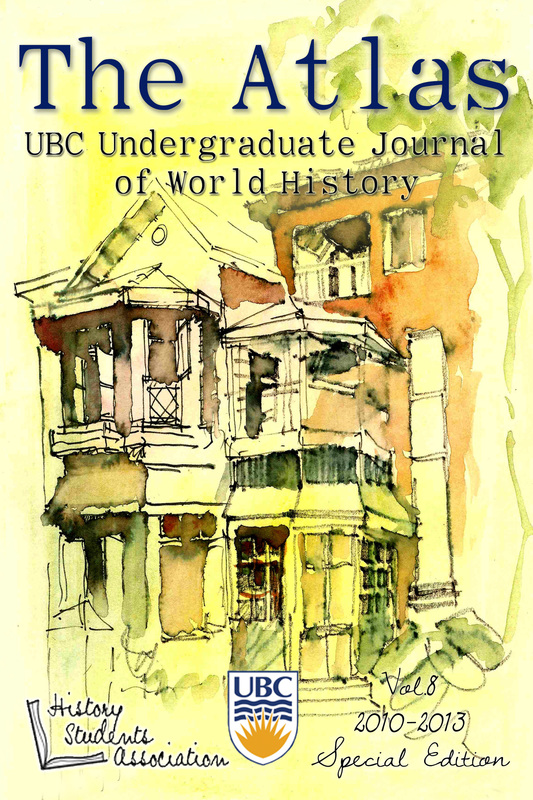 The Atlas Undergraduate Journal of World History is accepting submissions for its spring 2019 issue. We encourage undergraduate students, regardless of faculty, who have written papers covering any area of history to submit their work to atlasjournal@gmail.com by 28th December, 2018. 1. All submissions must have citations and a bibliography in accordance with the Chicago Manual of Style, 16th Edition. 2. Submissions should not simultaneously be under review by other academic journals. 3. Submissions should fall between 1,500 and 6,000 words in length, excluding title page, foot/endnotes and bibliography. Papers should be submitted as Word documents. Please direct any questions to atlasjournal@gmail.com. Rebecca Silver and Caroline Cassinelli, Editors-in-Chief, are pleased to announce this year’s editorial board! A warm welcome back to Kevin Ang, Peter Bruno, Tessa Mouzourakis, and Carmen Watson! They return this year as Senior Editors. We are pleased to announce that Kelly Chan, Ben Dixon Isaac Fairbairn, Hannah Kahn, Beulah Lee, Laura Moberg, Jennifer Paxton, Esther Schmidt-Brown, Marcel Shelton, and Megan Simpson have joined this year’s board as Editors. We had a very strong applicant pool this year and we thank everyone who applied for their time and interest. The Atlas’ Editors-in-Chief are pleased to announce the 2017/18 editorial board! We sincerely thank all for their interest, as we had a particularly competitive pool of applicants this year. 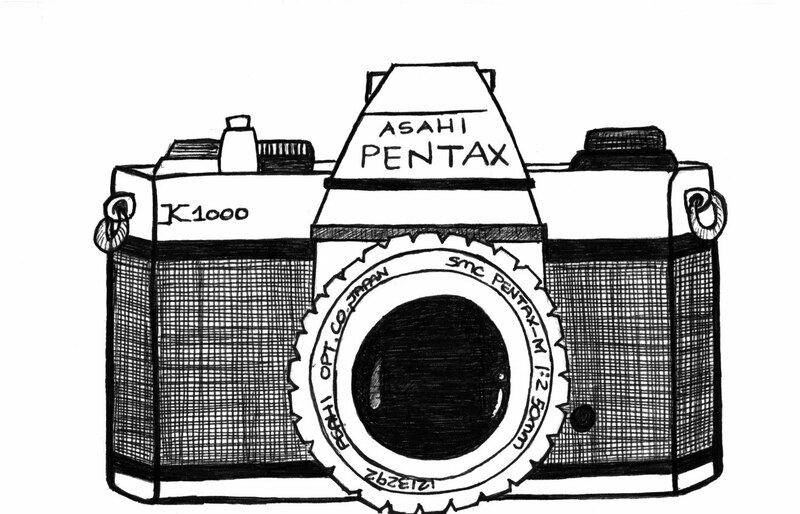 Please be on the lookout for our call for submissions in the next few weeks. In the meantime, get to know more about our editorial board. We encourage all UBC Vancouver undergraduate students (regardless of Faculty) to submit their work for publication. Submissions must be of historical relevance. While original research is preferred, we consider all content submitted to us, including the work of lower-year students (1st/2nd year standing). Submit your papers to us at atlasjournal@gmail.com by January 8th, 2017. Submissions that do not follow all of our guidelines will not be considered for publication. Submit your papers to us at atlasjournal@gmail.com by January 1st, 2017. Submissions that do not follow all of our guidelines will not be considered for publication. The Atlas Undergraduate Journal of World History is looking for editors for its 2016/17 editorial board! The Atlas has been publishing outstanding student work for over ten years, and editors are a significant component of the Journal’s success. We feature original research produced by Undergraduate Students in the field of History and publish annually in April. If you would like to be part of our team, please apply by October 2nd. In the first term, members of the Atlas Editorial Board will attend editing workshops in October and November, as well as meetings on marketing and logistics for the current year. Other responsibilities in the first term may include promoting our call for submissions through posters and classroom announcements. During the second term, the editorial board will review, evaluate and edit the submitted papers; thus the majority of the Editors’ time commitment will be in the months of February and March. During this peak time, Editors can expect to commit up to 10 hours a week. Applicants need to show strong writing and analysis skills and be able to meet firm deadlines. Previous experience is not required. A strong interest in history is an asset, but being a history major or minor is not a requirement. Editors are required, at the time of their acceptance, to join the History Students’ Association if they have not already. A brief statement of interest. Your intended major(s) and year level. An academic writing sample of at least 500 words. Being a member of the Atlas Editorial Board is an excellent opportunity to connect with like-minded peers and enrich your UBC experience. We look forward to hearing from you; it’s going to be a great year! We encourage all UBC Vancouver undergraduate students (regardless of Faculty) to submit their work for publication. Submissions must be of historical relevance. While original research is preferred, we consider all content submitted to us. We ask that book reviews be limited to books published within the past five years. Submit your papers to us at atlasjournal@gmail.com by December 23, 2015. Submissions that do not follow all of our guidelines will not be considered for publication. 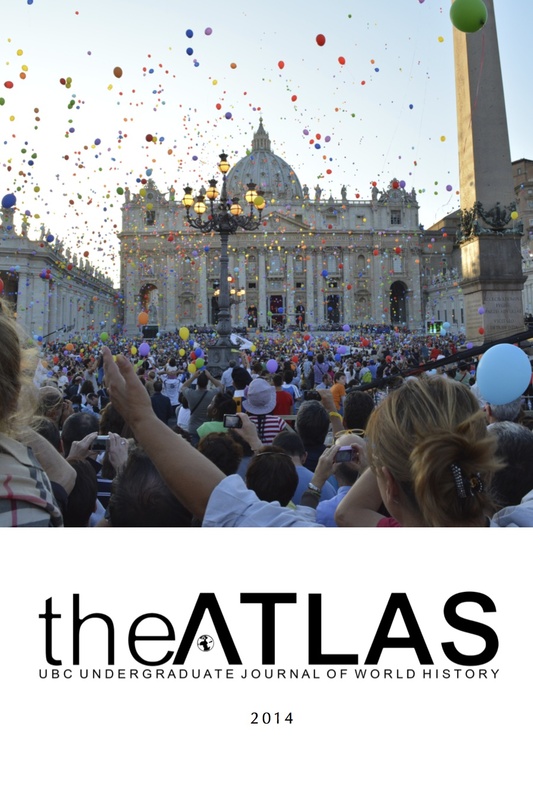 Atlas 2014-15 Edition – Now Online! It’s that time of year again — time to start thinking about your term papers! 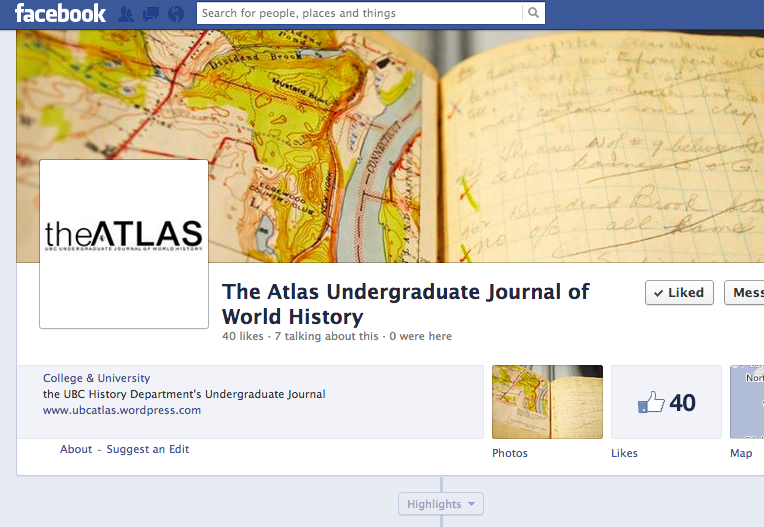 Why not draw inspiration from our most recent edition of the Atlas? Our 2014-2015 edition is now available for viewing online here! Our beautiful 2014-15 cover, designed by Jennifer Lee. 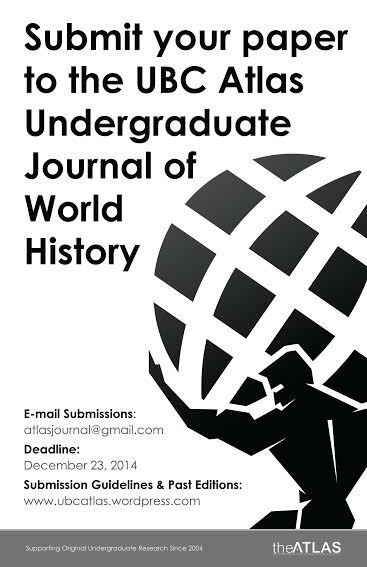 The Atlas Undergraduate Journal of World History is looking for Editors for its 2015/16 edition! The Atlas has been publishing outstanding student work for over ten years, and Editors are a significant component of the Journal’s success. 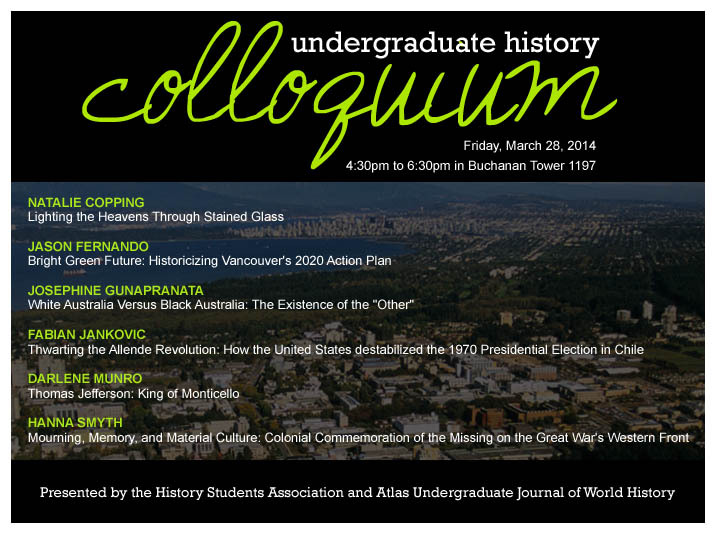 We feature original research produced by Undergraduate Students in the field of History and publish annually in April. If you would like to be part of our team, please apply by October 2nd. In the first term, the members of the Atlas Editorial Board will attend our editing workshops in October and November in addition to other occasional meetings. Other responsibilities in the first term include promoting our call for submissions through posters and classroom announcements. During the second term, the editorial board will review, evaluate and edit the submitted papers; thus the majority of the Editors’ time commitment will be in the months of February and March. During this peak time Editors can expect to commit up to 10 hours a week. 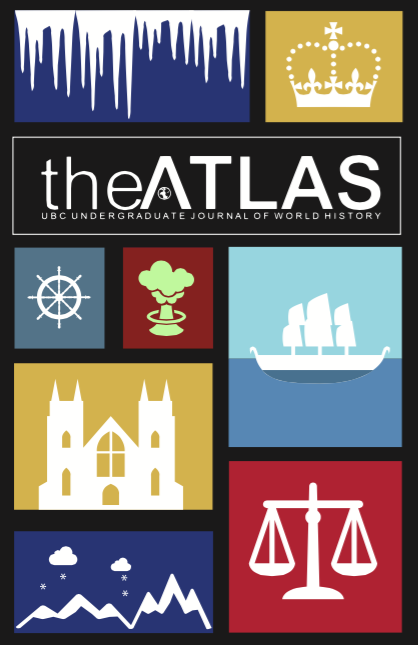 We are now accepting papers written by undergraduate students for the 2015 edition of the Atlas. Papers do not need to be written by history majors or minors, but have to entail a historical perspective. Papers should be based on original research and have not been published previously. The submission deadline is January 15th 2015, make sure you send us your papers by then! For any questions, please contact us through the above email address.